Stone circles are the most inspiring and evocative of all ancient sites. They date from the Early Bronze Age, circa 2500 – 1600 BC. Their purpose is unknown, but they were probably used for ceremonial purposes. Stone circles often indicate alignments with astronomical events such as Equinox and Solstice sunsets, sunrises and moonrises. Some are exact circles, others are oval. 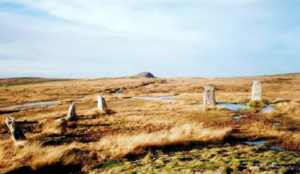 They often form central points with outlying systems of standing stones, barrows and other ancient sites, and also with prominent natural features in the landscape. 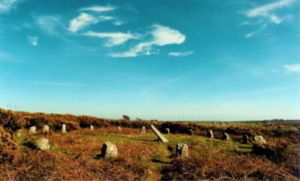 Stone circles in Penwith are large, flattened rings that contain many different irregularly shaped stones. 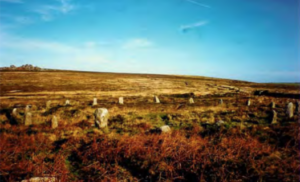 The name ‘Nine Maidens’ has been given to several stone circles, although they do not always have nine stones. Maiden is thought to derive from the Cornish ‘meyn’ for stone, although the origin of nine is unclear. 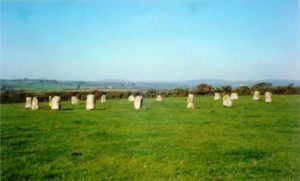 In Penwith the stone circles typically have nineteen stones, which could indicate a relationship with a 19-year solar and lunar cycle. This Bronze Age ruined site, much disturbed by mine workings nearby, now has only 11 stones standing or leaning out of a probable original 19.